Photovoltaic panels can be well worth the investment even if you live in a winter wonderland. Snow and solar cells aren’t mutually exclusive, according to a Michigan Technological University scientist. 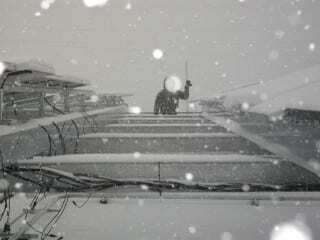 True, a layer of snow can cause a solar-cell blackout for awhile. But not many locales enjoy heavy snow for more than a few months. And even in the bleak midwinter, panels don’t usually stay snow-covered for long. “Sometimes snow actually helps solar cells,” says Michigan Tech’s Joshua Pearce. He’s referring to the albedo effect, when sunlight reflects off snow. It can make a panel generate more electricity in the same way that it gives skiers sunburn on sunny winter days. With researchers from St. Lawrence College and Queen’s University, in Kingston, Ontario, and a team of 20 industry partners, Pearce studied the effect of snow on the Open Solar Outdoors Test Field. They created a computer model to predict how much power generation would decline in various amounts of snow cover and on different types of solar modules mounted at different angles, from flat to steeply pitched. Then they validated their model with data from many of Ontario’s huge commercial solar farms. “In most cases power losses are minimal, even in snowy Canada,” Pearce said.